NEAR FIELD COMMUNICATIONS ... NFC - MetaModern Magazine, The Voice of Our Digital Meta Modern Culture. In our modern world in our Era of Communications, we have experienced a growth of application widgets specifically set out to enhance and simplify our basic, everyday, lifestyle needs. One of which widget via NFC, includes, “NFC”, Near Field Communication. Whilst fantastic in theory and in proper application, as it lends towards a greatness of ease and accessibility, for swift transference of data and information, it also has an inherent lurking evil. Although, the implementer and the user, of such a direct communications may not, on the face of it, be aware that there is any danger to such a transfer of close-ranged informational exchange, the danger lies not within the RFID, but rather within the intended targets. NFC’s notable history lends to the most comprehensive means of understanding and discovering the intentions and capabilities of this type of communication. The below is its history via wiki. “…NFC traces its roots back to radio-frequency identification, or RFID. RFID allows a reader to send radio waves to a passive electronic tag for identification, authentication and tracking. 1983 The first patent to be associated with the abbreviation RFID was granted to Charles Walton. 2002 Sony and Philips agreed on establishing a new technology specification and created a technical outline on March 25, 2002. 2009 In January, NFC Forum released Peer-to-Peer standards to transfer contact, URL, initiate Bluetooth, etc. 2011 Google I/O “How to NFC” demonstrates NFC to initiate a game and to share a contact, URL, app, video, etc. 2011 NFC support becomes part of the Symbian mobile operating system with the release of Symbian Anna version. 2012 March. EAT., a well-known UK restaurant chain, and Everything Everywhere (Orange Mobile Network Operator), partner on the UK’s first nationwide NFC-enabled smartposter campaign, led by René Batsford, head of ICT for EAT., also known for deploying the UK’s first nationwide contactless payment solution in 2008. A specially created mobile phone app is triggered when the NFC enabled mobile phone comes into contact with the smartposter. 2012 Sony introduces the “Smart Tags”, which use NFC technology to change modes and profiles on a Sony smartphone at close range, included in the package of (and “perfectly paired” with) the Sony Xperia P Smartphone released the same year. 2012 Samsung introduces TecTile; a set of MIFARE NFC stickers and a companion application for Android to read and write the TecTile stickers, and design macros that can be triggered by them. 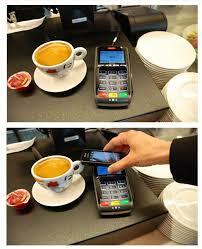 2013 Samsung and Visa announce major partnership to develop mobile payments.